In 1877, pioneer Peter Milton Salmon and his family settled in, what was eventually named, Bloomfield. Next to his property he found a ruin settlement which was dated back to 1088 AD to 1290 AD. Unlike many of the pioneers that moved into the Four Corners area, the Salmon family went out of their way to protect the ruin site. In 1898, his son, George, filed a homestead claim for the land containing the ruin site; making sure the Salmon family would continue to protect it. In the 1970s, archaeologist, Cynthia Irwin-Williams and a team of students excavated the site which allowed them to date the site properly. Many artifacts were found which also helped the team determine the reasoning behind each room. That's a very brief history behind Salmon Ruins; now lets get to the meat of it all. As you enter the main building, check in at the reception desk, pay the very, very small fee and you'll be given a guide book which needs to be returned when you're done. Don't worry, for only $3 you can purchase a copy of the book in the gift shop. To the left is the museum which gives a good viewing of artifacts, history of the Native people, and the Salmon family themselves. There is also an activity center for the children, but the adults can try out things too. Down the steep walkway which is lined with many native plants, such as Mormon Tea; the first structure you'll pass is the Amphitheatre where events take place. If you continue left, past the Amphitheatre, you'll go to Heritage Park. Unfortunately we did not get to see this area; we'd already done the ﻿Aztec Ruins that morning; after going right and seeing the Salmon Ruins, we were simply done in. We go to the Farmington area often, so going back is no big deal. You might not have that option, so see it all when you're there! Going to the right of the Amphitheatre, we walked past the old Salmon Homestead. Along the path to the ruin site is a low lying brick wall with a plaque dedication to the Ancestral Natives, Dr. Irwin-Willams and the person who spent the money on the wall and plaque. Not sure why there was not a mention of the Salmon family, since, if it wasn't for them, that site might not have been protected as well as it had. Past this is the first sighting of the ruins, and you know immediately something special is just around the corner. That feeling was definitely not incorrect! Now get your guide books ready, follow the path, room markers and enjoy the tour. Room 128 "The Bowling Alley"
Room 127 and path to the Plaza. Room 124, square room converted into Kiva. Room 124, white patch on wall only remaining piece of wall painting. The Tower Kiva is one of the most important points of the settlement. Built in 1088 AD, surrounded by rooms used to support its foundation; the rest of the settlement was built around this focal point. At least two fires did significant damage to the settlement; in the second fire, 21 children and 4 adults died. Their bodies were put into the Kiva and given a mass ceremonial cremation. The interior of the Kiva had wall paintings, but only a single section of white exists today; the fire and natural elements destroyed the majority. Stone steps in the north wall of a room. Original logs sticking out of walls. Altar in Room 82; light hits the altar during the Summer Solstice. There are two more sections of the settlement to walk through before you reach the Great Kiva. An unusual wall section in Room 33 looks like a curved window frame, but this was part of a Kiva that was built into the room at 1170 AD. 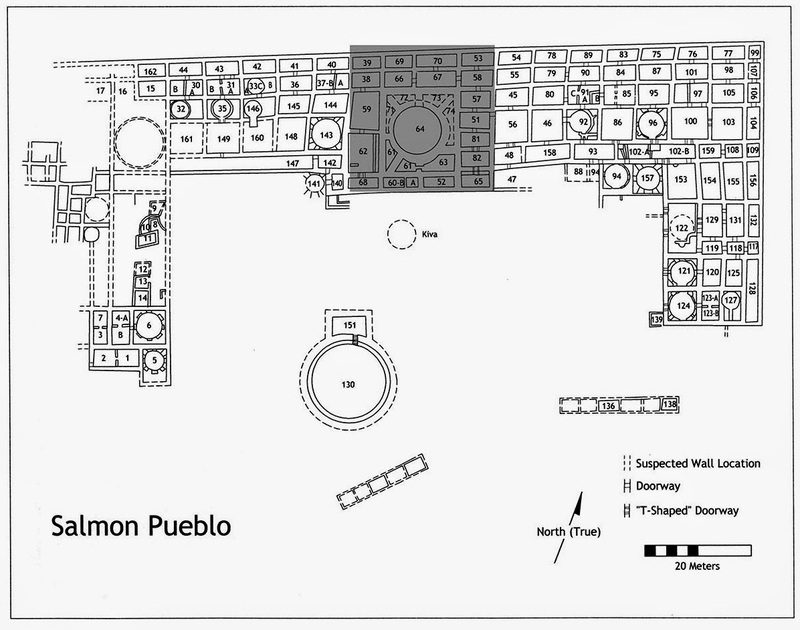 Due to the possibility of erosion and damage, this Kiva was filled in after excavation; it has been compared to the reconstructed Great Kiva located at Aztec Ruins. That concludes our little adventure at Salmon Ruins; we were totally exhausted, so stopped for a quick dinner before heading on home to Monticello. So, next time you're in the Farmington area and wonder what's to do east of there....follow Route 64 to the Salmon Ruins. Double Stack to Fishmouth - Comb Ridge, Part Two.